On balance. And cleaning out cabinets. I recently sent someone a link to Gretchen Rubin‘s post on what she calls “spending out,” the idea of using your good stuff instead of saving it for some mythical future time and thereby wasting your most valued ideas and possessions. To me, this means wearing the gorgeous boots, even though I’ll scuff them up, since they don’t do any good in the closet. Hanging up old family photos, even though they might fade in the light. Drinking out of my grandmother’s teacups, even though I might break them. Eating the expensive artisan jams and caramel sauces and pickles I buy for my column instead of keeping them, prettily, in the cabinet. Rereading the post inspired me to take a look around my kitchen this weekend to see what I’m unconsciously hoarding and use it up. The stuff I came up with wasn’t necessarily anything special, it was just all stuff that would be better put to use than not: some overripe bananas I’d stashed in the freezer, a hunk of milk chocolate, a bag of hazelnuts, some red lentils, odds and ends of rice and grain mixtures, a couple of sweet potatoes, homemade stock. I remember reading an Anne Tyler novel when I was in high school, the one with the albino-ish guy who falls in love with one of his boarders*, and there’s a point when another character muses that if someone woke her up in the middle of night and told her — quick! — to name the most important thing in the world, she would say privacy. Poor 15-year-old Stephanie read that and was genuinely concerned that she didn’t know what her most important thing in the world was, young Stephanie being a bit of a worrier. But I’ve done and growed up and I know my answer now: balance. I need to be involved in a lot of different projects at different stages. When I’ve been around other people, I need a goodly bit of time alone. I need to do work that’s challenging, but not all the time. And when I’ve been eating either an insanely decadent banana bread made with browned butter and chocolate and toasted hazelnuts or a relatively plain, vegetable-rich lentil and brown rice soup, I need plenty of the other to balance it out. 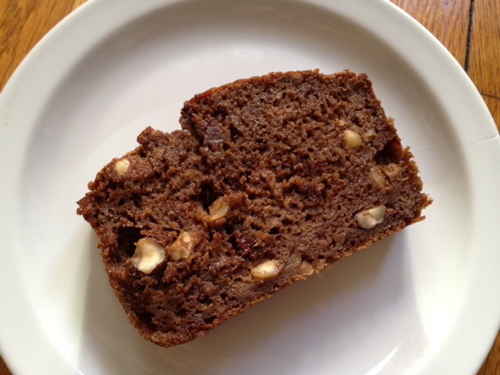 For the banana bread, I combined recipes from the Moosewood cookbook and Nigella Lawson’s How to Be a Domestic Goddess. The Moosewood one is terrific and usually my go-to, but it makes two loaves and I didn’t want that much nor to do any math, however simple (this looks like the recipe here). I do like that it has you steep the mashed bananas in some coffee, so I started there. I had to melt the butter anyway, so I figured I might as well brown it while I was at it. And I didn’t have any white sugar, so used brown. Nigella mentions that you can add some chocolate and swap out 2T of flour for cocoa if you want. That seemed like a good idea. (Her original is here, complete with the addition of raisins, the devil’s snack) I had a hunk of chocolate around that I chopped up, which I like because then some of the fine shards melt into the batter, but you still get some chunks. Chocolate chips would work though. I’d been writing my gift guide for Serious Eats right before I started baking, so I had Granola Lab‘s Activation Energy granola, which is made with coffee and chocolate and whole hazelnuts, on my mind. The bread already had coffee and chocolate and I had some hazelnuts on hand, so that was a natural fit. 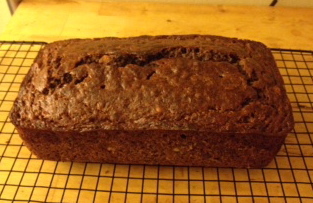 The bread turned out to be utterly delicious, not too sweet, with the banana and chocolate flavors perfectly balanced. I’m not sure the browned butter added much, what with everything else going on, but it certainly didn’t hurt anything (learn how here). I did find it a little too moist to eat easily by hand, since I’d added some liquid to the mix, so I changed the amount of flour below to help out with that. Combine the bananas and coffee in a large mixing bowl, set aside. Preheat the oven to 325F. Butter a 9×5″ loaf pan. Add butter and sugar to the banana mixture, then add the eggs and vanilla, mixing well. Combine the dry ingredients in a separate bowl, the stir gently into the batter. 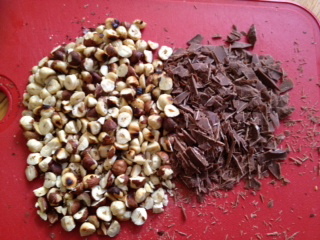 Fold in nuts and chocolate. Scrape into the loaf pan and bake in the middle of the oven for 1 – 1 1/4 hours, or until a toothpick inserted into the center comes out clean. Leave the pan on a rack to cool. 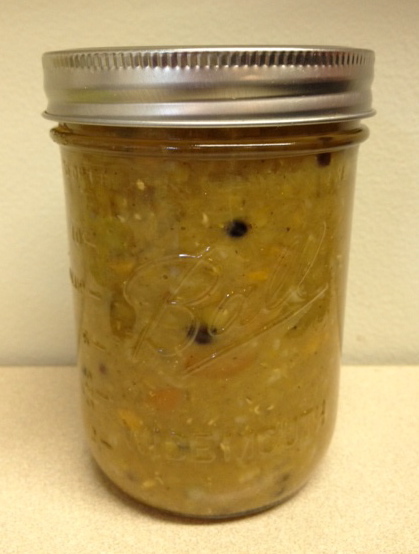 The soup recipe below combines this one from Heidi Swanson and this one from the Times. It’s wholesome and delicious and makes a week’s worth of lunches for pennies. I don’t really measure anything when I put a pot of soup together, so this recipe has more of a narrative quality, than a reproducible list of ingredients and instructions, but there’s enough information there to follow along, if you’re interested. Chop and onion and several cloves of garlic; soften in olive oil. Add a spoonful of cumin, two spoonsful of tomato paste (I keep a tube in my fridge: best thing ever), and a pinch of cayenne; stir for a minute. Add a finely chopped large carrot, two finely chopped sweet potatoes, a cup and a half of red lentils and a cup of mixed brown rice and any other grains. Cover with water or stock by two inches, bring to a boil, then lower heat and simmer until lentils, vegetables, and rice are cooked through. Salt to taste and stir in the juice of one lemon. Serve as is, or fully or partially puree for a smoother soup. *FINE. I looked it up. It was Celestial Navigation.